Lamb prices continued to charge higher this week, despite stronger yardings. The higher prices are showing no signs of dampening demand, with some categories hitting new highs, while others eased off this week. 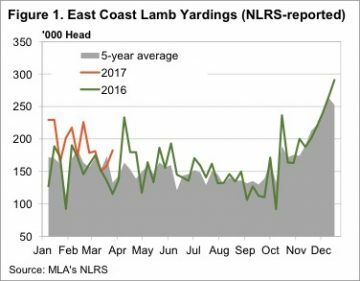 East Coast lamb yardings responded to the higher prices of recent times by ramping up to a five week high. Producers are obviously looking to take advantage of higher prices by cashing in any lambs that are near ready. Lamb yardings were much higher than last year, but Easter came early in 2016. 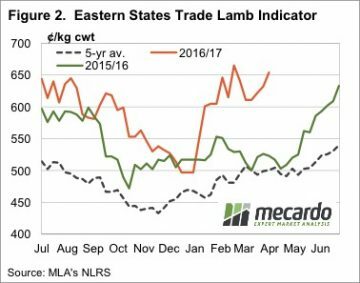 The Eastern States Trade Lamb Indicator (ESTLI) gained 22¢ this week, hitting 654¢/kg cwt, just 11¢ off the peak hit back in February (figure 2). It was NSW which drove the ESTLI higher this week, as the 25¢ rise saw a new record price of 659¢/kg cwt. Light lambs in NSW saw a 42¢ rise to be the highest indicator in the land, at 673¢/kg cwt. By contrast, light lambs in SA fell 58¢ to sit at a paltry 539¢/kg cwt. For a 17kg cwt lamb that is a $23/head difference. It wasn’t all bad news for growers in SA, with mutton prices rallying 97¢, or 28% to 437¢/kg cwt. Still behind Victoria at 482¢, SA prices couldn’t stay that low for too long. 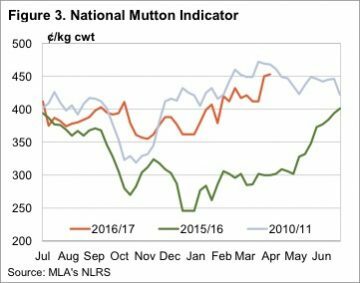 The rally in Mutton on the east coast was offset by a 76¢ fall in WA and as such the National Mutton Indicator gained just 3¢ to 453¢/kg cwt, it can’t quite get to the record (figure 3). The rain from Cyclone Debbie shouldn’t impact the lamb market too much, but it won’t hurt. Lamb supply out of northern NSW is likely to be disrupted, so we can expect some solid support for lamb markets. Some forward contracts for trade lambs have been floating about this week at 670¢ for May. While processors don’t always get it right on their forwards, there is little to suggest they are going to look silly by being a long way above the market.